Earlier in the year I shared some top tips for growing super-spicy peppers. Well, after plenty of careful nurturing and a recent run of fine, warm weather, I’m delighted to say my first chillies are ready for picking. These ones won’t hang around for long – I’ve a cheek-flushing chilli bean recipe I’ve been itching to try out! Nevertheless, with lots more fruits on the way, there will definitely be enough for drying and storing in a few weeks. 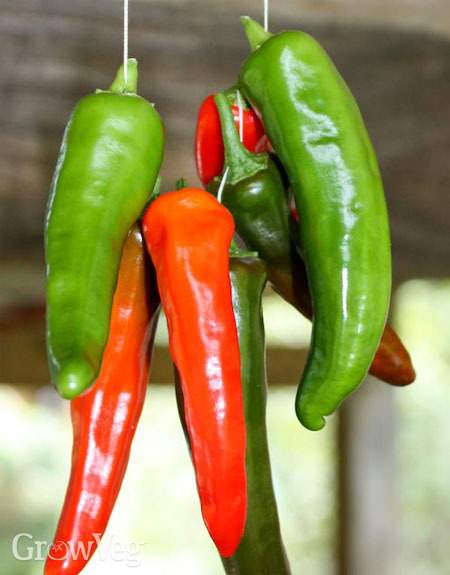 Drying is an excellent way of preserving chillies. The thin walls of the fruits make them quick and easy to dehydrate, ensuring a ready supply of crinkle-dry chillies to enjoy right up until next year’s harvest. Dried chillies are just as versatile as fresh chillies. You can store them in containers, thread them into a chilli ristra, grind them into a paste and even infuse oil or vinegar with these warming wonders. You don’t need to wait until your chillies turn colour before you pick them. The fruits can be picked as soon as the seeds inside have matured, when they will have turned from small and white to full-sized and beige. If you are going to pick lots of fruits, or you’re a little absent-minded like me, then wear a pair of gloves for the job. Even thorough scrubbing fails to remove all traces of chilli pepper’s spicy capsaicin; as you might imagine, a careless rub of the eye during a momentary lapse of concentration can be painful. Gloves will shield your hands from the fiery fruits, so once you’re done harvesting you can whip them off and continue safely about your day’s work! If you want to make a ristra then cut the chillies with plenty of the attaching stem intact. If necessary, wipe the fruits with a dry cloth to remove any traces of dirt. A ristra is simply an arrangement of drying chip;i peppers. They’re incredibly easy to make and they can look just stunning. Fine, smooth fishing line is the best thread for your ristra because it offers least resistance, enabling the chilies to slide on with ease. Cotton thread comes a close second. Begin by tying a knot into one end of the line. The knot will support the first chilli so it needs to be a good size so it won’t drop off. Thread the other end of the line through a darning needle then begin threading on your chillies. Push the needle through the green cap of each chilli, rather than the flesh of the fruit, which could serve as an entry point for mould. Once all of your chillies are threaded on, tie off the line to make a loop. 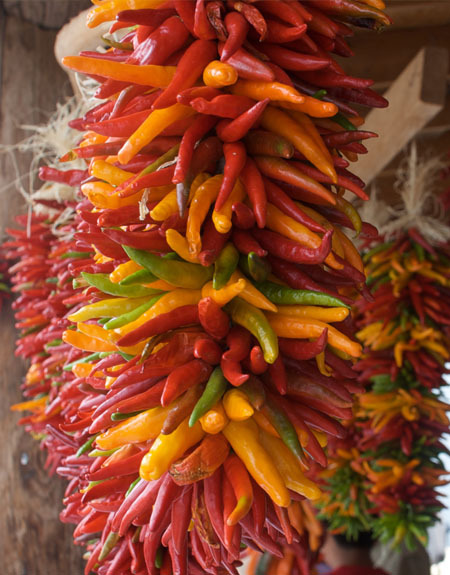 Arrange the chilli peppers by spacing them out in a spiral formation – each chilli should be offset about 30 to 60 degrees from the previous one. A spiral ristra not only looks prettier, it improves airflow around the fruits, which will help them to dry out quicker. Hang your ristra in a warm, well-ventilated place. An alternative to air-drying is to use a dehydrator set to a suitable temperature. The warm flow of air will see the fruits dried out within 24 hours or so. To speed drying, and ensure a thorough job, start by splitting the just-picked chilli peppers in two lengthways. Lay them out onto your trays and set them to dry. Again, a pair of gloves will come in handy for this. If you don’t have a dehydrator you can simply dry your fruits by threading them onto lengths of fishing line or cotton thread, spacing them out one by one like miniature Christmas stockings. They shouldn’t take longer than two to three weeks to dry, after which time they can be finished off in an oven set to a low heat for an hour. Dried chilli peppers can be stored in any airtight container. Keep them whole or halved for dropping into spicy homemade curries, or pulverise them first – in the food processor or with the end of a weighty rolling pin (somewhat noisy but strangely satisfying!). You can use your dried chillies as needed, or infuse whole fruits in sterilised bottles filled with olive oil to make chilli oil. Fellow GrowVeg blogger Barbara also has a truly scrumptious recipe for chilli paste – it comes tried, tested and thoroughly approved! Of course, if you’ve got other ideas for storing and using dried chilli peppers then don’t hesitate to let me know – just share your recipes, techniques and anecdotes below. "more of a need for suggestions than a comment. Here is my dilemma. I am new to the gardeneing community. last year was my first vegitable garden, started kind of late in the year but still had a lot of fun, with a decent production. This year however, I am focusing more on my passion, Lots of peppers. I have never dried peppers in any shape or form, sweet and mild I do not forsee an issue in using my dehydrator But, I am growing some VERY hot peppers this year, Ghosts, Trinidad Moruga Scorpions and of coarse the well loved, or feared, Carolina Reaper. Any suggestions on drying these bad boys out? and even further, some insight on grinding them after they are dried. Many Thanks"
"Hi Alex. The article above applies to all chili peppers - even the very hottest ones! Once they are fully dried out, you can crush them up in a pestle and mortar and store them in airtight jars if you wish. Another option is to run them through a coffee bean grinder. You can then add your very own super-spicy chili powder to curries etc. I personally keep the fruits dried whole, then if I want to crush them I grind them up just before use. That way, like coffee beans, you're keeping more of the flavour intact and releasing it just before cooking. But go easy - you've some VERY hot ones there! "